I know you City Mice are right proud of your uber-cool horse-and-driver-less buggies, and your monorail…MonoRail…MONORAIL…MONORAIL and all. And I suspect you’ve never driven– errr, I mean, been driven– on a dirt road. But out here in the country we Country Mice sure do love our “Morning Rides” over hill & dale & dusty trail. What a pleasant scene, don’t you think? 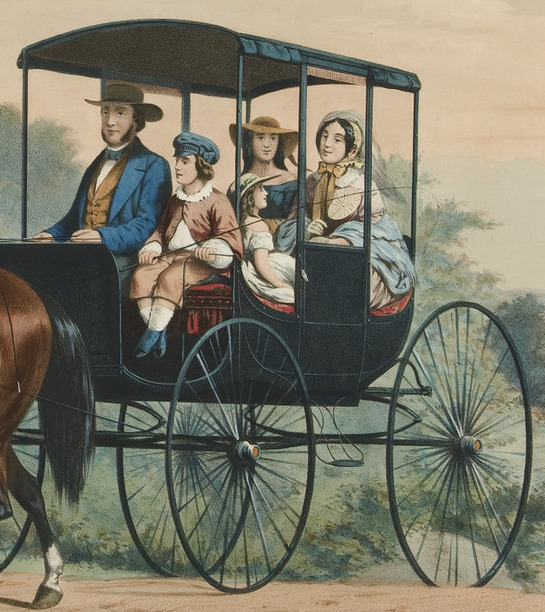 Look at that family, sitting up there in that buggy! On top of those skinny little wheels! The five of them so happy to be enjoying their Morning Ride. Shouldn’t that fellow be worried about how much weight is in that there buggy on those skinny wheels in that sandy dirt road? Should he be worried? Let’s take a closer look-see and maybe do a calculation or two. 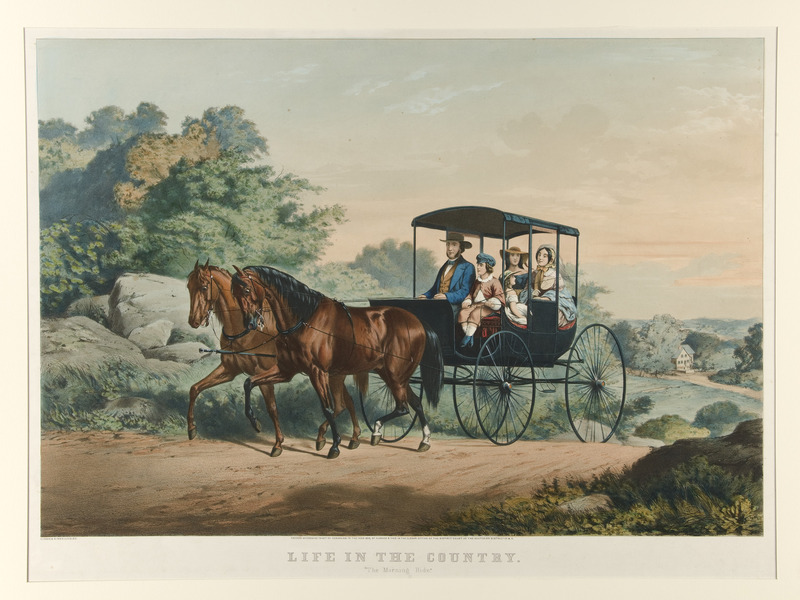 First off– I don’t think he has anything to worry about because his buggy– and his horses– seem to be floating on air. Neither the horse’s back leg nor the buggy’s front wheel has made a track. This is not a photograph. Perhaps the artist was careless and forgot to depict the tracks. So, how much could that family weigh? … … … I calculate about 450 pounds total– people were shorter back in the crappy olden days. And the buggy? How much could it weigh– axels and all? (When was steel invented ’cause that would matter in the calculation.) Certainly not 350 pounds. So the whole contraption– Country Mice passengers included– could not possibly weigh 800 pounds. can be approached from more than one perspective. We’ve discounted the apparition that the horses are floating on air and pulling the buggy through the air with them. We’ve reasoned through how much the buggy might weigh. We must now think again about the horses and their power. think again about the horses and their power. think again about the horses and their power work. think again about the horses and their power force. think again about the horses and their power friction. think again about the horses and their power et cetera. Whew! All that thinking was exhausting!! I conclude that it is possible for four white mice to easily turn to, sorry, wrong cartoon two horses to carry a buggy weighing 800 pounds over soft sandy soil without leaving nary a track. Now to the matter of the loaded down Taurus. The buggy is high off the ground. But have you looked at the buggy’s’ tires?